Let us introduce to the location of our 2017 Winter Escape at Bali’s premier Health and Wellbeing Spa Retreat, Bagus Jati. This fabulous resort is set in 5 hectares of hillside gardens amongst lush tropical forests in the mountains of Ubud, Bali. 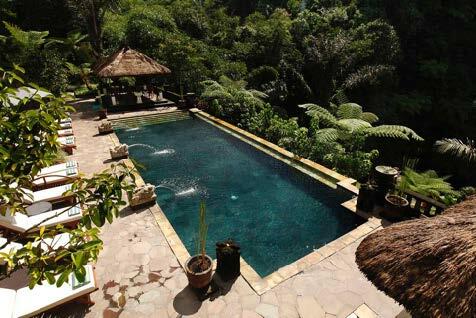 Accomodation consist of luxurious villas with wide windows overlooking the tropical forest. Each villa has a private verandah which allow guests to relax on the day beds and soak in the stunning views of mountains, valleys and lush tropical flora and fauna. Bagus Jati was designed to provide sufficient space between the beautifully appointed villas for absolute privacy, and in a circular style based upon early primitive village dwellings combined with the chakra principle concerning energy flow. As a health and wellbeing resort Bagus Jati provides the freshest products, blended with fresh herbs and spices for a scintillating and unforgettable dining experience. The daily menu is specially designed to offer a wide range of dishes to suit a healthy lifestyle and to satisfy the appetite. Most of the produce are grown within Bagus Jati’s premises and underlie strict ecological permaculture principles. The Surya restaurant and Bar is surrounded by spectacular views of the river valley, gardens and Mount Agung. 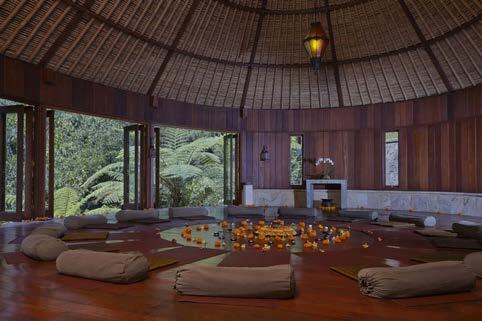 Enjoy the nurturing and harmonious atmosphere of the 2 uniquely designed circular Yoga pavilions with vistas onto a natural bamboo forest. You will get the BONUS of 2 for 1 with the inspiring and real teaching duo, your retreat hosts – Kate and Sam. Sam is the co-owner of ADELAIDE YOGA FLOW. Sam loves a creative flow with musics to keep you moving with the breath. You never know what you will get in the class as they are tailored to who is in the room and how everyone feels…. She literally goes with the flow. Kate is the owner of PURE HOT YOGA. Kate is brings personality, creates strength in body and space for the mind. Her classes are fun and challenging with options for all. She teaches a variety with elements of static postures, vinyasa and a fusion of both. Do as much or as little as you want!